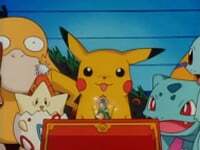 Pokémon Chronicles Episode 22: "Christmas Night" and "Kanga Games"
In "Enjoy Christmas," Pikachu and the other pokemon are left to play in a cabin while their trainers go out to get some Christmas cake. As the pokemon play with the various Christmas knickknacks, they accidentally knock over the Christmas tree! This upsets Pikachu so much that it unleashes a thunderbolt that destroys the overhead lights, causing a blackout! However, Pikachu thinks quickly and uses its cheeks to light up the Christmas tree, enabling it to spread the holiday cheer. In "Enjoy the Snow," Pikachu and its friends discover the fun that can be had playing in the snow. At one point, Togepi wanders off and bumps into a Garura and its baby. After having a playful snow fight, the pokemon decide to go sledding! After nearly crashing into a lake, our heroes are saved by the mother Garura. 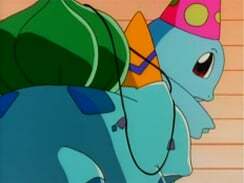 Night begins to fall, and the pokemon thanks Pikachu and the others for playing with its child. The very first Pocket Monsters OVA is this Christmas-themed episode, and it's pretty...insipid. While we will eventually see some good human-less shorts, the two that make up this episode are really kind of a chore to sit through. I understand there may be a certain amount of charm to these shorts, but it's overshadowed by the sheer uselessness of the short. I guess 4Kids didn't know what to do for a final Chronicles episode, so they just took their dub from 2000 and went with that. The episode is uncut for the VHS and DVD versions, but the Chronicles version makes a few small changes due to the need for commercial breaks. Togepi keeps its Japanese voice. In the VHS and DVD versions of these shorts, all of the Japanese background music is intact, proving that the movies aren't the only things 4Kids can leave alone. However, when 4Kids turned this into a Chronicles episode, some dub music is added. I'll talk more about that later on in the comparison. The title screen for "Enjoy Christmas" is two seconds longer than the title screen for "Christmas Night." Brock: "It was really nice of Professor Oak to let us stay here for the holidays." Misty: This is gonna be the best Christmas ever!" Ash: "Come on guys! We gotta go pick up the Christmas cake!" Originally, Takeshi talks about how he thought they had finished all their preparations. Kasumi then scolds Satoshi for forgetting the Christmas cake, and Satoshi apologizes. 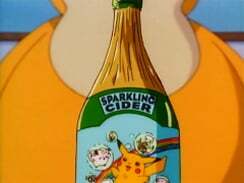 So basically, 4Kids made up the whole thing about Professor Oak letting them stay there. The bottle that Koduck plays with gets a paint edit. Nothing in the Japanese version of the episode states that it's champagne or anything like that, but I guess 4Kids wanted to play it safe by slapping that label on it. After the Christmas tree falls on top of Pikachu before the commercial break, there's a shot of Fushigidane and Zenigame turning around to see what happened. This shot is removed from the Chronicles version of the episode but is intact for the VHS and DVD versions. Because of this cut, 4Kids surrounded the cut scene with some of their own music to transition from commercial better. Later, the final shot of the first shot is shortened by one second. 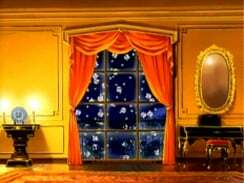 After that, a 24-second shot of a window showing a "snowstorm" of Purin is removed from the Chronicles version of the episode. Seriously, all it is a zoom-in shot of the image below while Purin sings. Finally, the title screen for the second short is two seconds shorter than it was in the Japanese version. In the second short, the footage of Pikachu and the others screaming as Iwaku is propelled down the hill is repeated for the Chronicles airing. In the original version and the VHS/DVD, this shot is not repeated.